The WISE spacecraft sits under its protective covering after its arrival at Vandenberg Air Force Base, where it will launch from this winter. WASHINGTON ? NASA's new asteroid-hunting spacecraft willroll out to the pad at Vandenberg Air Force Base, Calif., Friday inpreparation for launch next month. Known as the Wide-field Infrared Survey Explorer (WISE), thespacecraft will spend the next 10 months circling the Earth over the poles,scanning the complete sky at infrared wavelengths to uncoverhidden cosmic objects, including cool stars, dark asteroids and luminousgalaxies. "You can kind of think of it as the Google Map of theuniverse," said Amy Mainzer, NASA?s deputy project scientist for WISE,explaining that the instrument will take repeated exposures of the same swathof sky, creating overlapping images as the telescope progresses through its skyscan. The stars and galaxies will appear fixed on the sky in each exposure, butasteroids will move over short amounts of time. "WISE is going to be finding about 100,000 new asteroids inthe main asteroid belt," Mainzer said during a Nov. 17 news conference at NASAheadquarters here. "And we expect it?s going to find several hundred newasteroids that getclose to Earth orbits. These are asteroids and comets whose orbits takethem close to Earth?s orbit." The $320 million project, managed by NASA's Jet PropulsionLaboratory in Pasadena, Calif., was competitively selected under NASA'sExplorers Program, managed by the agency's Goddard Space Flight Center in Greenbelt, Md. 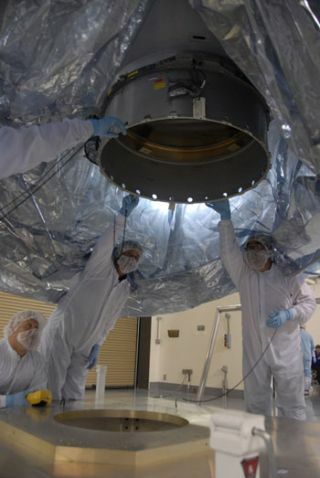 The science instrument was built by the Space Dynamics Laboratory in Logan, Utah, and the spacecraft was built by Boulder, Colo.-based Ball Aerospace &Technologies Corp. WISE principal investigator Edward "Ned" Wright of the University of So uthern California, Los Angeles, said the instrument will provide a vastimprovement over past infrared sky surveys. "We will find millions of objects that have never been seenbefore," he said during the news conference. In addition to near Earth objects, WISE will find coolstars, known as browndwarfs, which glow feebly like chunks of heated coal. By studying browndwarfs, astronomers can learn more about star formation, as well as theatmospheres of planets orbiting stars beyond the sun. "WISE is going to survey the whole sky and find thesenearest neighbors and transform our view of the solar neighborhood," said PeterEisenhardt, WISE project scientist at the Jet Propulsion Laboratory. "It'spossible that one of these nearby brown dwarfs is even closer to the sun thanany star that we now know of." The mission also will spot dusty nests of stars, swirlingplanet-forming disks and evolving galaxies. "WISE has been designed so that it can detect thesecataclysmic dusty forming galaxies out to a distance of 10 billion light yearsover the entire sky," said Eisenhardt. "So we're going to find the mostsuper-duper, hyper-ultra luminous forming galaxies in the universe, and we'llsee just how extreme this galaxy forming process can get." The mission will map the entire sky at four infraredwavelengths with sensitivity hundreds to hundreds of thousands of times greaterthan its predecessors, cataloging hundreds of millions of objects. The datawill serve as a navigation chart of sorts for other missions, pointing them tothe most interesting targets. NASA's Hubble and Spitzer space telescopes, theEuropean Space Agency's Herschel Space Observatory, and NASA's upcoming Sofia andJames Webb Space Telescope will follow up on WISE finds. "This is an exciting time for space telescopes," said JonMorse, Astrophysics Division director at NASA headquarters here. "Many of thetelescopes will work together, each contributing different pieces to some ofthe most intriguing puzzles in our universe."